We decided to stop at a quaint shop called Mackey’s Ferry Peanuts. Where better to get some boiled peanuts than a place with “peanuts” in the name? The cute country store had locally-produced jams, peanut butters, fudge and candy. They also had flavored peanuts and we tried a few. When we asked about getting a sample of the boiled peanuts, the obliging clerk disappeared for a moment and returned from the back with a few soggy shelled peanuts. We cracked… no squished open the shell and each grabbed out a nut. The nuts are prepared by boiling “green” peanuts in salty water for four to six hours. The steaming of course gives each nut a salty taste that’s similar to dry-salted peanuts. But, depending on the boiling time, the nuts can take on a more bean-like texture, and we both found the soggy shell a little strange. Boiling peanuts, or “goober peas,” has been a folksy practice in the south since the 1800s. 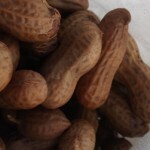 The practice of eating boiled peanuts was likely brought by to the colonies by African slaves. Farmers would boil surplus peanuts and extended families and neighbors would gather to share conversation and food. Peanut boils as they were called were a great community gathering opportunity. Despite a little apprehension, we finally decided to buy a small $3 Zip-loc bag of peanuts and we were on the road again. I was enjoying the peanuts, but Kimmer told me once we got in the car that he didn’t like them. Why didn’t he just say so in the store? They didn’t go to waste though – I ate most of the bag. As we’ve moved further into the south we’ve seen boiled peanuts in gas stations, roadside stands and chain stores. Thinking of boiling your own – here’s a recipe. i think i might like those……….